This Snickers Fudge from Cupcakes & Kale Chips is an easy candy recipe made more irresistible with two kinds of chocolate and Snickers candy bars. Yes, your favorite candy bar gets stuffed between a layer of white chocolate and a layer semisweet chocolate fudge for double the chocolaty deliciousness. 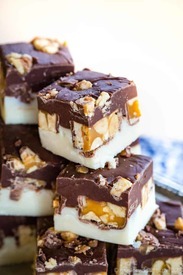 And to make it even better, this Snickers candy bar fudge recipe has only five ingredients and you can make it on the stove or in the microwave. It is definitely one of the best gluten free no-bake dessert recipes!